When Jennifer proposed the theme of this month's Sugar High my thoughts, as one who knows me at all would surely assume, turned to yearnings for chocolate. But, though happy in those thoughts, I began to consider that which I most longed for as of late. Not a food or flavour specifically, but more of a mood or moment - I'd been pining for the arrival of summertime. Sure, the mercury has been on the rise and the trees are well dressed in their abundant leaves, but somehow it still has not felt summer enough. It was not those broad shouldered, blue-eyed lazy days of August, where the sun smiles so brightly that the world seems lit from within. So how could I evoke this feeling through food? In southern Ontario, the warming months bring bustle back to farmers markets. Roadside fruit stands seem to multiply exponentially overnight. Punnets, pints and bushels make their way back into our weekend lexicon as the harvests roll in. And the harvest inextricably tied to the season? Berries. Luscious and bursting with a sweetness born of sunshine, the ripening of Ontario strawberries coincides perfectly with the official start of summer. 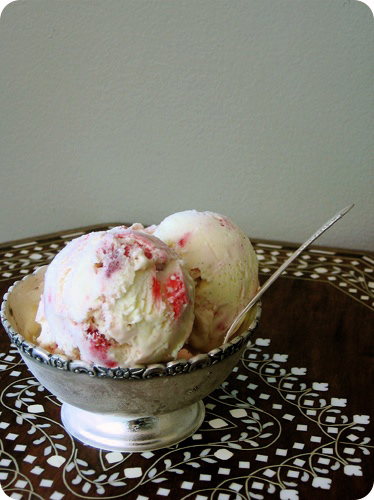 Classic in every way, this strawberry swirl ice cream embodies nostalgic thoughts of childhood holidays. This is the taste of evenings on the swingset at my favourite ice cream stand; white stripes of cream coating our arms to our elbows as we sat, sucking the icy bits of strawberry until they turned supple and soft again. Here, I wanted a taste that was purely luxurious berries and cream, and so chose to go with a dense, velvety rich vanilla custard base punctuated with tart strawberries. The psychedelic tie dye effect of broad ribbons of reddest red against the creamy whiteness was the look I had wanted, but feel free to blend the strawberries further for a more feminine hue. My interpretation of a variety of sources, with thanks. Prepare an ice bath using a large bowl full of ice and water. Have another bowl, one that will fit inside the first without becoming fully submerged, set aside. In a heavy-based saucepan pour in the half and half. Using the back of a knife, scrape the seeds out of the bean and into the saucepan, add the pod as well. Season with salt. Over medium heat, bring this mixture to a simmer. 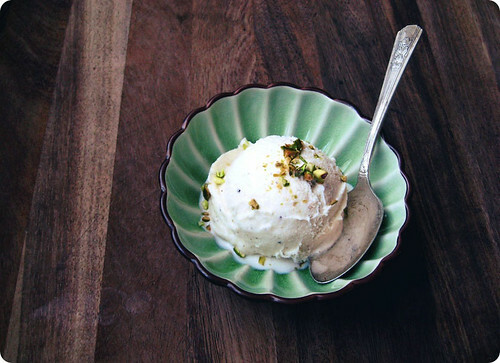 Turn off the heat and allow the vanilla to infuse into the liquid for 30 minutes. Turn the burner back on and bring the mixture back to a gentle simmer over medium-low. In a bowl that can withstand heat, whisk together the egg yolks and 2/3 cup of sugar until it becomes pale yellow and fluffy. Whisking constantly, pour a thin, steady stream of the half and half into the yolk mixture. Once combined, pour the mixture back into the same saucepan and return to the heat. Using a wooden spoon, stir the custard constantly until thickened and coats the back of the spoon, anywhere from 6 to 10 minutes. Using a medium-fine mesh sieve, strain the custard into the clean bowl set aside earlier. Immediately place this bowl into the ice bath. Stir occasionally until the custard comes to room temperature. The vanilla bean can be taken at this point, rinsed and set aside to dry on a kitchen towel. Once dry, it can be used to make vanilla sugar. Once the custard has cooled, stir in the the heavy cream. Cover and refrigerate until well chilled (I like a good couple of hours). Meanwhile, mash the strawberries with the remaining 1 tablespoon sugar and lemon juice. Set aside at room temperature to macerate. When the custard is chilled, follow the manufacturer's instructions to churn the ice cream. Once the ice cream is ready, remove the machine's dasher and gently fold in the strawberries and their juices. Do not overmix. Transfer to a food storage container then tightly seal and freeze for at least 2 hours. • Decadent as this version is, richer versions feature as many as 6 egg yolks for the same amount of liquid and a higher ratio of heavy cream to half and half (or milk). Choose the one that best suits your taste. • If there seems to be too much accumulated strawberry juice, hold some back to maintain the texture of the ice cream - you do not want it to become waterlogged (well, juicelogged). • For a pink version, rather than the marbled result here, strain the accumulated juices from the strawberries into the cooled custard before pouring into the machine. Add the strawberries through the feed tube during the last 5 minutes of churning.